Dean was born in Chicago moved to Walnut Creek in 1969. He attended Monte Vista High and graduated in 1973. 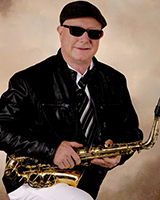 He Majored in performance and earned a Bachelor of Arts degree on sax at Cal state Hayward. Dean has recorded with Rodney Franklin on a CBS label and has toured with La Toya Jackson. He has taught music at Consumers Music in Vallejo and is currently teaching at Mozart Einstein & Me in Livermore as well as Geddes Music in Brentwood.